Typical conservative collection methods for genetic integrity and minimal ecosystem impact apply. Not noted in literature. 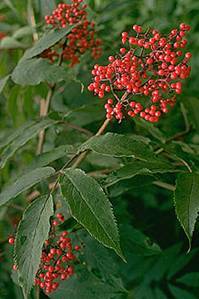 Red elderberry takes on a sprawling tree-like form in favorable conditions therefore wide spacings of 2 m or more might be appropriate. (1) Cooke, Sarah Spear. A Field Guide to the Common Wetland Plants of Western Washington and Northwest Oregon. 1997. Seattle Audubon Society, Seattle WA. (2) Franklin, Jerry F. & C. T. Dyrness. Natural Vegetation of Oregon and Washington. 1988. Oregon State University Press, Corvallis OR. (3) Hitchcock, C. Leo and Cronquist, Arthur. Flora of the Pacific Northwest. 1998. University of Washington Press, Seattle and London. (4) Kozloff, Eugene. Plants and Animals of the Pacific Northwest. 1978. University of Washington Press, Seattle and London. (5) Kunze, Linda M. Preliminary Classification of Native, Low Elevation, Freshwater Wetland Vegetation in Western Washington. 1994. Washington State Department of Natural Resources, Olympia WA. (6) Leigh, Michael. Grow Your Own Native Landscape. 1999. Washington State University Cooperative Extension – Thurston County, WA. (7) Pojar, Jim and McKinnon, Andy, eds. Plants of the Pacific Northwest Coast: Washington, Oregon, British Columbia and Alaska. 1994. Lone Pine Press, British Columbia. (8) Potash, Laura and Aubry, Carol. Mt. Baker-Snoqualmie National Forest Native Plant Notebook. 1997. North Cascades Institute. Sedro-Woolley WA. (9) Rose, Robin, Chachulski, Caryn and Haase, Diane. Propagation of Pacific Northwest Native Plants. 2000. Oregon State University Press, Corvallis. (10) USDA, NRCS. 2002. The PLANTS Database, Version 3.5 (http://plants.usda.gov) National Plant Database Center, Baton Rouge, LA 70874-4490 USA.